Climate change poses significant challenges to Southeast Asia. The region is highly exposed to extreme weather events, and both warming and extreme events – high temperatures and heavy precipitation – are projected to increase in future decades. Agriculture, which accounts for more than 10% of GDP in most countries in the region, is highly sensitive to climate impacts, and persistent poverty in rural areas, low levels of education, spatial isolation, and neglect by policy-makers, can amplify those impacts. Vulnerability is particularly high in rural areas, which are home to more than three-quarters of the region’s poor people, many of them smallholders or subsistence farmers. Building resilience in agrarian communities is thus a priority. 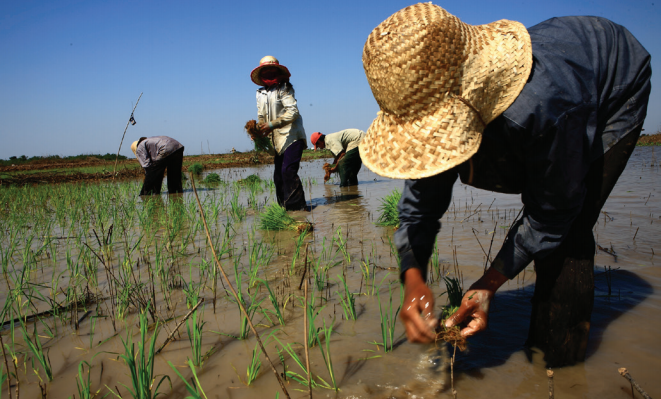 Increasing agricultural productivity is central to the Association of Southeast Asian Nations (ASEAN) countries’ efforts to lift rural areas out of poverty. Climate change could undermine those efforts, so effective adaptation is crucial. The review, based on a framework of adaptation readiness, summarized here assessed the steps taken so far to reduce rural populations’ vulnerability. The aim was to identify gaps and key concerns for future research and action, and, most important, help policy-makers to more effectively reduce vulnerability. This discussion brief* focuses on smallholders – defined here as farms of less than 2 hectares, using household labour. Smallholders are central to Asian agriculture, and their situation can be precarious, their livelihoods and food supplies dependent on the timely availability of water and the absence of hazards that can lead to crop losses and livestock deaths. *the discussion brief can be downloaded in full from right-hand column or viewed online via links under Further Resources. Recommendations from the brief are provided below. Develop a regional agenda for the adaptation of smallholders. As noted above, adaptation efforts in the region have failed to address social aspects of vulnerability. A regional adaptation agenda needs to be developed that targets the needs of vulnerable groups. Investments in “no-regret” options such as new crop varieties, climate smart extension services, climate change ready agronomic practices, and livelihoods support could be introduced, but these need to be sensitive to, and cognizant of, the everyday lives of poor(er) groups and individuals. Directly engage smallholders in adaptation planning and decision-making. The IPCC Fifth Assessment Report finds with high confidence that engaging rural people in decision-making, especially to understand autonomous adaptation and the interplay of informal and formal institutions, plays an important role in strengthening public decision-making. Farmers need to have a strong voice in adaptation processes, so they can articulate their concerns and priorities, as their views are grounded in their daily lives and experiences. Smallholders’ concerns can be quite different from those of scientists; for example, a case study in the Lower Mekong Basin found that while scientists were focused on long-term shifts in average temperature and rainfall, community members were most concerned about irregular rainfall patterns during the growing season and/or periods of extreme temperature that intensify annual droughts. Support sub-national networks and processes to advance adaptation. There is a need to proactively engage sub-national actors in adaptation planning and policy, and this includes supporting sub-national networks and processes. This will also facilitate engagement with key populations such as smallholder farmers. In countries where adaptation policies and plans are already fairly advanced, national governments could increase outreach to sub-national stakeholders, to increase awareness of these policies and plans and provide opportunities for feedback. What is notable is that some of the poorest countries with the least capacity have something to teach their richer and apparently more capable neighbours. This therefore upturns the usual pattern of knowledge production and dissemination in the region. Build public support for adaptation. Public support for adaptation is generally lacking in the ASEAN countries, and needs to be generated on the ground. One key strategy is to engage smallholders in adaptation planning. Drawing on experiences in the region such as in Indonesia, one suggestion is to consider developing farmer field schools focused on adaptation, to demonstrate the cultivation of climate-resilient crop varieties and to enable knowledge-sharing among farmers. Facilitate sharing of adaptation insights and experiences. ASEAN countries that are currently developing their adaptation frameworks and approaches, such as Cambodia, Laos and Myanmar, will gain from the experiences of other countries that have made substantial headway in their planning for adaptation. Institutionalizing a platform for knowledge-sharing at the regional level could create synergies among existing knowledge portals. With its convening power and ability to draw in resources and expertise from regional and international actors, GIZ’s Forestry and Climate Change (FOR-CC) programme in the ASEAN countries could play a valuable role in this context. The programme could provide a framework to regularly track adaptation in the agriculture and forestry sectors, particularly in reviewing barriers to adaptation that are encountered, and facilitate the sharing of information and insights cross-nationally. Set up strong monitoring and evaluation systems to facilitate learning from adaptation actions. Effective monitoring and evaluation (M&E) can facilitate learning by providing a structured approach for measuring success and understanding what factors are critical for success. FOR-CC could support impact evaluations of recently concluded adaptation projects, using GIZ’s own M&E system for national adaptation action, or one of several other available M&E frameworks, such as Tracking Adaptation and Measuring Development (TAMD) by the International Institute for Environment and Development, or UK CIP’s ADAPTME. Guidance is also available from the now-defunct Southeast Asia Climate Change Monitoring and Evaluation Communities of Practice. Strengthen funding for adaptation planning and action. There are several funding opportunities available bilaterally and multilaterally, with some of them established recently through the UNFCCC process. These include the Adaptation Fund, the Least Developed Countries Fund, the Special Climate Change Fund, and Global Climate Change Alliance. There is also funding through philanthropic organizations, and there are efforts within the field of adaptation to match global funding sources with national priorities, such as through the U.S. Agency for International Development (USAID) Adapt Asia Pacific. As adaptation is local, and local capacities need to be built, it is important that these funding opportunities are also made available to local community groups and civil society organizations. ASEAN, through the ASEAN Climate Resilience Network (ASEAN-CRN) or related technical working groups, could establish a funding window, possibly small grants, for these organizations, perhaps to provide rapid response to a potential crisis or to build capacities for a foreseen climate or weather-related risk. The Samdhana Institute, an NGO based in Bogor, has experience providing such small grants, and could serve as an example. Given the importance of having a national or regional implementing entity (NIE/RIE) to secure finance through the Adaptation Fund and the Green Climate Fund, it may also be worthwhile to explore how the ASEAN Secretariat could be accredited as a regional implementing entity, to expand these countries’ access to the two funds. The ASEAN Secretariat has already acted as a conduit for an EU peatlands project. This discussion brief summarizes a desk review commissioned by GIZ of the adaptation readiness of ASEAN Member States. This discussion brief was written by Albert Salamanca and Ha Nguyen, as part of the Adaptation and Mitigation in support of AFCC project commissioned by GIZ ASEAN Jakarta. The review was funded by Forest and Climate Change (FOR-CC), one of the modules of the ASEAN German Programme on Response to Climate Change in Agriculture and Forestry (GAP-CC) of the German Federal Ministry for Economic Cooperation and Development (BMZ). FOR-CC is a technical cooperation implemented by GIZ in close cooperation with ASEAN during 2015 to 2017. The authors would like to thank Jonas Dallinger and Imelda Bacudo of FOR-CC for their support and advice. This discussion brief has also benefited from comments from Dennis Wichelns and Jonathan Rigg. Any shortcomings solely belong to the authors.